Editor's note: Listings for Galaxy Theatres of Atascadero (805-466-8437) were incomplete at press time. PickSpike Lee (Do the Right Thing, Malcolm X, Summer of Sam, Inside Man) directs this comedic crime biography about Ron Stallworth (John David Washington), a black rookie police office in Colorado who, with the help of a white undercover counterpart (Adam Driver), becomes a member of the local Ku Klux Klan chapter. PickWriter-director Isabel Coixet (The Secret Life of Words, Learning to Drive) helms this story based on Penelope Fitzgerald's novel about a small-town power struggle between two women. Set in 1959 England in a conservative East Anglian coastal town, the story pits free-spirit widow Florence Green (Emily Mortimer) against local matriarch Violet Gamart (Patricia Clarkson), whose polite but ruthless ire is raised when Green opens a bookstore and starts pushing novels by Ray Bradbury and Vladimir Nabokov. Reclusive book-loving widower Edmund Brundish (Bill Nighy) takes up Green's banner in the face of local opposition. This is one of those based-on-a-novel films that feels entirely like it's based on a novel. From the broad archetypal characters to the omniscient narrator offering exposition, The Bookshop feels like a book and a somewhat slow one at that. 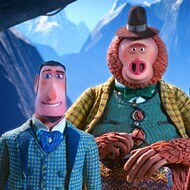 The film seems more interested in clinging to its source material than constructing an effective film. If that doesn't put you off, what remains has its charms, chief among them Bill Nighy, who's fantastic as small-town recluse Edmund. Nighy can play quiet nobility like nobody's business. His interactions with Florence breathe life into the otherwise stodgy proceedings. He plays Brundish, a man who's given up on humanity and prefers to spend his days in his manor house reading. In a note he sends to Florence asking her to send him books, he tells her he prefers to read autobiographies of good people but fiction about nasty people. Their May to December romance never moves beyond handholding, but it's very sweet. 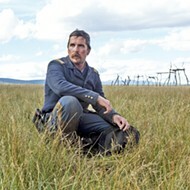 Clarkson as Violet is all surface charm with underlying malevolence. She wields the men around her like her personal cudgels, from her husband General Gamart (Reg Wilson) to her personal minion, the effete and conniving dandy Milo North (a scenery-chewing James Lance). Violet makes it her mission to evict Florence and her bookshop from The Old House, a long-vacant stone building that Violet wants to use as a town art center. It's not clear why it must be this particular property, which adds to the story's forced contrivances. The other element of the story that adds a bit of life to the goings-on is precocious tween Christine (Honor Kneafsey), who works for Florence in the afternoons when school gets out. Christine is a livewire and not the least bit interested in reading, but she's essential to the film's conclusion, which is less than triumphant but satisfying nonetheless. PickJon M. Chu directs this rom-com based on Kevin Kwan's best selling novel about native New Yorker and Chinese economics professor Rachel Chu (Constance Wu), who travels to Singapore to meet her boyfriend Nick Young's (Henry Golding) ridiculously wealthy family. Once there, Rachel realizes Nick's the most eligible bachelor in Asia, and all the single women are out to undermine her. PickVictor Lenin wrote and directed the story of Frank (Keanu Reeves) and Lindsay (Winona Ryder), two oddball loners who attend a destination wedding in San Luis Obispo County. Frank is the brother of the groom who has a rocky relationship with his family; Lindsay is the groom's ex-fiancée. The two acknowledge the fact they're the people "you don't know where to stick." 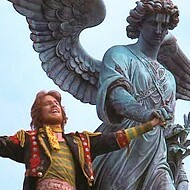 The film begins by listing its subtitle: "A Narcissist Can't Die Because Then the Entire World Would End." This quickly defines the humor for the rest of the film—a much more offbeat and cynical tone than most rom-coms. We promptly meet our characters living in their own worlds. Frank is shown obsessively clearing his throat while listening to cable news; Lindsay is exhaling directly on a houseplant in dismay, pleading with it to not die. After these introductions, we aren't properly introduced to any other characters. Periphery characters grace the screen now and then—and are occasionally discussed by Frank and Lindsay—but no one else earns a speaking role (unless a vocal mountain lion counts). From the second Frank and Lindsay meet at the airport until closing credits, Destination Wedding mostly consists of their pessimistic banter. While the dialogue is witty, dark, and enjoyable, perhaps the most amusing part of Destination Wedding is reserved for locals. It's easy to smile or nudge your friends when Frank and Lindsay talk about the urban planning of San Luis Obispo, take winding walks through familiar mountains, or bicker at the Apple Farm. I attended the Downtown Centre premiere, and there was something incredibly sweet about residents gathering together to show pride for their small town taking a turn playing Hollywood. PickCo-writer and director Harold Cronk (Lindsay Pulsipher) helms this faith-based drama about widowed young mother Amber Hill (Lindsay Pulsipher), whose soldier-husband died in Afghanistan. Can she find a way to raise her young daughter Bree (Makenzie Moss) and make her life worth living? Jon Turteltaub (Phenomenon, Instinct, National Treasure) directs Jason Statham as former Naval Captain Jonas Taylor, whose career and marriage were destroyed after he abandoned part of his crew during a failed exploration of the Mariana Trench in what he claimed was an attack by a 70-foot shark. Five years later, when a sub crew is stranded in what may be an attack by the supposedly long-extinct 70-foot Carcharodon Megalodon, Taylor is recruited to attempt a rescue. PickWriter-director Christopher McQuarrie (The Way of the Gun, Jack Reacher, Mission: Impossible—Rogue Nation) helms this action-packed sixth installment of the Mission: Impossible franchise, starring Tom Cruise as super spy Ethan Hunt. The new film ties together narratives and characters from earlier films, including IMF (Impossible Mission Force) team members Luther Stickell (Ving Rhames) and Benji Dunn (Simon Pegg), Hunt's Rogue Nation love interest and fellow spy Ilsa Faust (Rebecca Ferguson), and Hunt's ex-wife Julia Meade (Michelle Monaghan) from Mission: Impossible III. Corin Hardy (The Hallow) directs this horror thriller about a novice nun (Taissa Farmiga) and a priest (Demián Bichir) with a haunted past who are sent to Romania by the Vatican to investigate the suicide of a young nun, who may have been affected by a malevolent spirit. Chris Weitz (About a Boy, The Golden Compass, The Twilight Saga: New Moon) directs Matthew Orton's historical script about a team of Israeli agents led by Peter Malkin (Oscar Isaac), who hunt down and bring to justice Adolph Eichmann (Ben Kingsley), the architect of Hitler's "Final Solution." Moral ambiguity permeates Matthew Orton's script about the capture of Adolph Eichmann. It questions whether the Israelis were too aggressive and indiscriminate about their pursuit of former Nazis. It tries to humanize Eichmann, employing moral relativism. This ambiguity makes the story more interesting but also infuriates. If ever there was a historical event so clearly unambiguous in its moral depravity, it's the holocaust. That said, if you can set aside the film's obsession with contriving a moral equivalence and ignore some clumsy plot choices, Operation Finale is entertaining and most assuredly well acted. Ben Kingsley plays Eichmann with a regality and ever-so-slightly-submerged menace. He's a man who has rationalized his actions at least in his public persona. He was "just following orders," simply a man at a desk "doing paperwork," not an active participant. He's also supposedly crafty, and after his capture when he's initially questioned by interrogator Zvi Aharoni (Michael Aronov), he maintains his cover story. The first weak plot turn is how quickly and easily he gives up his identity. It's a strange choice that sends viewers mixed signals—is Eichmann a master manipulator or is he so egotistical that he's easily twisted? Much of the story surrounds the team's work at getting Eichmann to sign a document agreeing to a trial in Israeli. Aharoni is unsuccessful, but Malkin (a charming Oscar Isaac playing him as a man who uses humor to hide his inner pain) believes he can do it. At heart, this story is supposed to be a battle of wills fought with chess-like cunning. Instead, it's about unnecessary red tape and a series of unexpected setbacks. Because the story's outcome is well-established history, the film requires a lot of manufactured drama to lead us to the conclusion we all know is coming. As good as the performances are, and as riveting as the historical basis of the story is, Operation Finale isn't Oscar material and the film knows it, otherwise the producers would have held it back for Oscar season. No, I think the only reason the film worked as well as it did was its source material. It's a pretty incredible tale, escaping Nazi Germany with dozens of other high ranking Nazi officers, living out your days in Argentina, a country and government apparently amenable to Nazi philosophy, a daring infiltration by foreign spies, an abduction and interrogation, a harrowing last-minute extraction and return to Israeli, a worldwide trial that revealed Nazi atrocities in all their unfiltered horrors, and finally justice for a man at the center of it all. How could it be anything short of amazing, right? HANDSOME ON HIS PLANET? An alien hunter (Brian A. 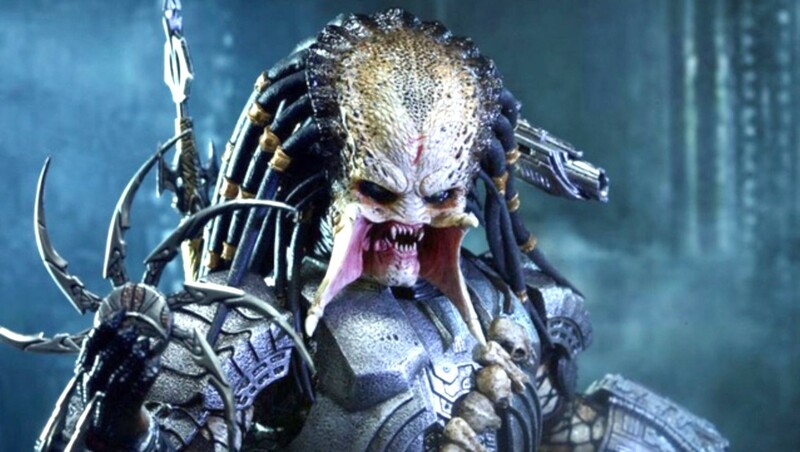 Prince) comes to Earth to harvest human trophies, in The Predator. PickMarc Turtletaub (Gods Behaving Badly) directs this story about put upon suburban mom Agnes (Kelly Macdonald) who discovers a love for solving jigsaw puzzles, leading to personal fulfillment she couldn't have imagined. The film also stars Irrfan Khan as Robert, who becomes Agnes' puzzle partner. What a lovely and heartbreaking film this is! This is really less about puzzling and more about a personal awakening. Kelly Macdonald is wonderful as Agnes, a melancholy wife and mother who sleepwalks through her days in service to her family. 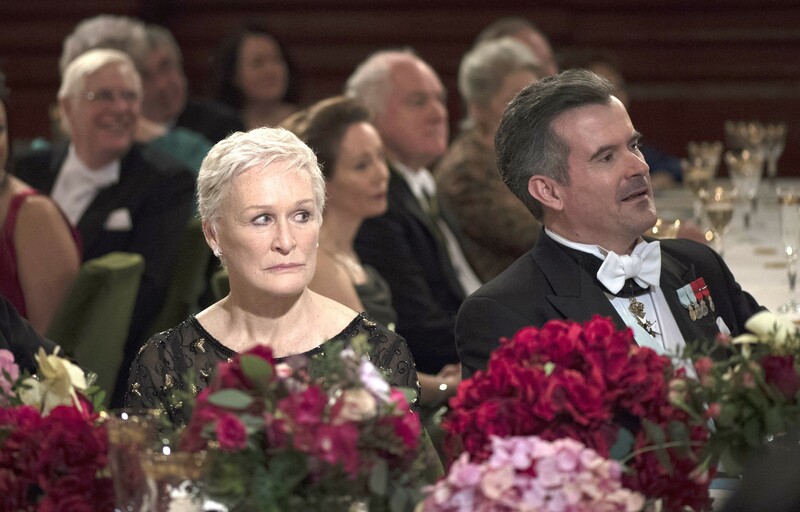 We see her prepare for a party, host, ask her husband Louie (David Denman) if he's having a good time ... and then we realize the party is for Agnes' own birthday. She's a doormat, and her husband and kids—shy, miserable older son Ziggy (Bubba Weiler) and younger more confident son Gabe (Austin Abrams)—take her for granted. In short, her life is an unfulfilling grind. She needs to learn to take care of herself. As the film opens, it's hard to tell the time period. It could very well be the 1950s judging from Agnes' dress and homemaker work ethic. It's not until she opens one of her gifts—an iPhone—that we realize it's present day. Another of the gifts she receives is a 1000-piece puzzle, and alone at home, she becomes consumed by it—her mathematical mind perfectly attuned to solving it quickly. 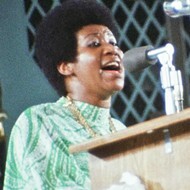 Even though she's a brief train ride from New York City, she hasn't been there in years. But in search of another puzzle, she goes to a puzzle shop and sees an ad posted by a champion puzzler looking for a partner. She answers the ad and meets Robert (a truly wonderful Irrfan Khan), an eccentric but lonely inventor, whose one invention—something to do with magnets—has made him rich. 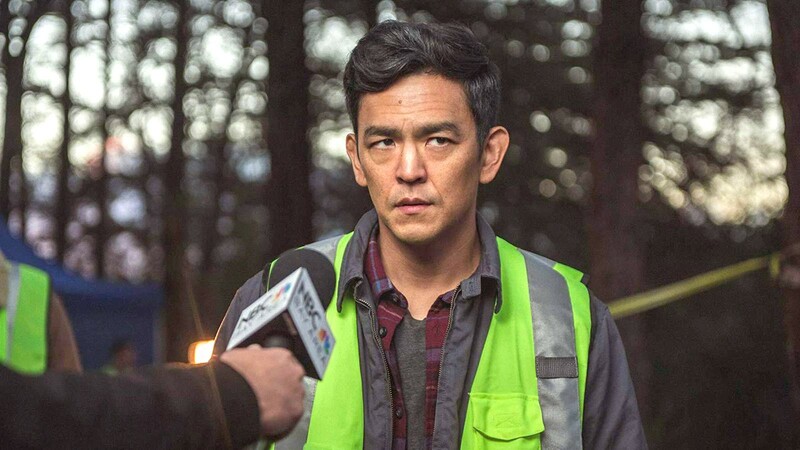 MISSING David Kim’s (John Cho) daughter Margot goes missing, leading him to break into her laptop to search for clues, in Searching. 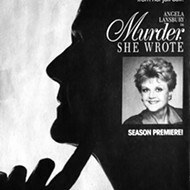 WHODUNIT? 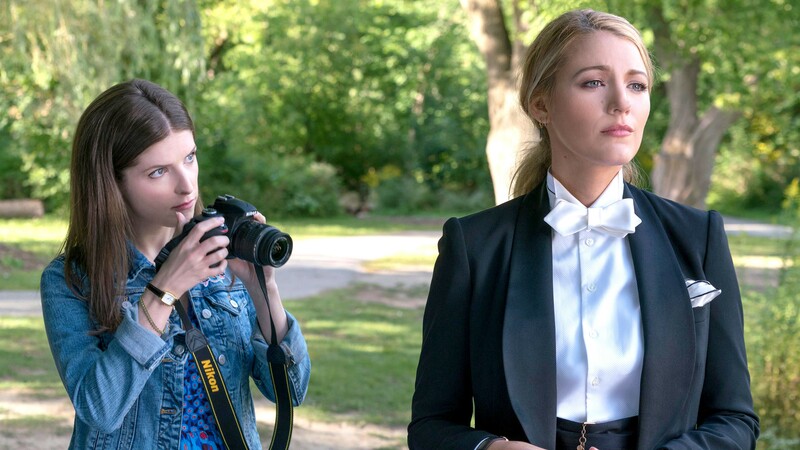 Mommy blogger Stephanie (Anna Kendrick, left) seeks answers about her new friend Emily’s (Blake Lively, right) sudden disappearance, in A Simple Favor. 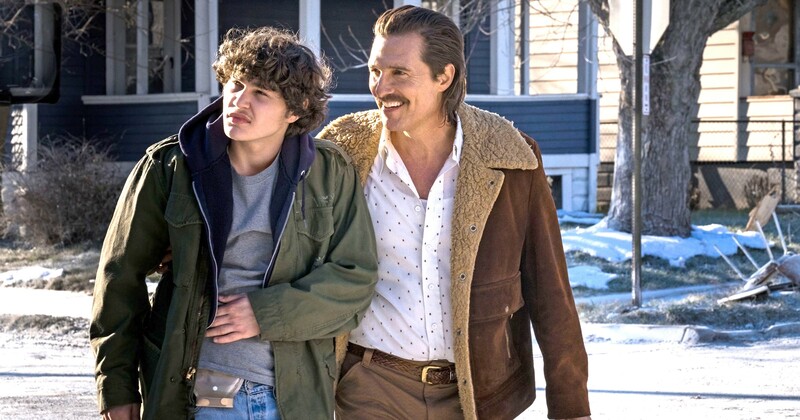 HUSTLERS Fifteen-year-old Richard “Rick” Wershe Jr. (Richie Merritt, left) becomes an FBI informant who’s eventually arrested for drug trafficking, in White Boy Rick, with Matthew McConaughey as his father Richard Sr.
WOMAN BEHIND THE MAN Joan Castleman (Glenn Close), wife of a Nobel Prize for Literature-winning author, begins to ruminate on her life choices during their trip to Stockholm, in The Wife.